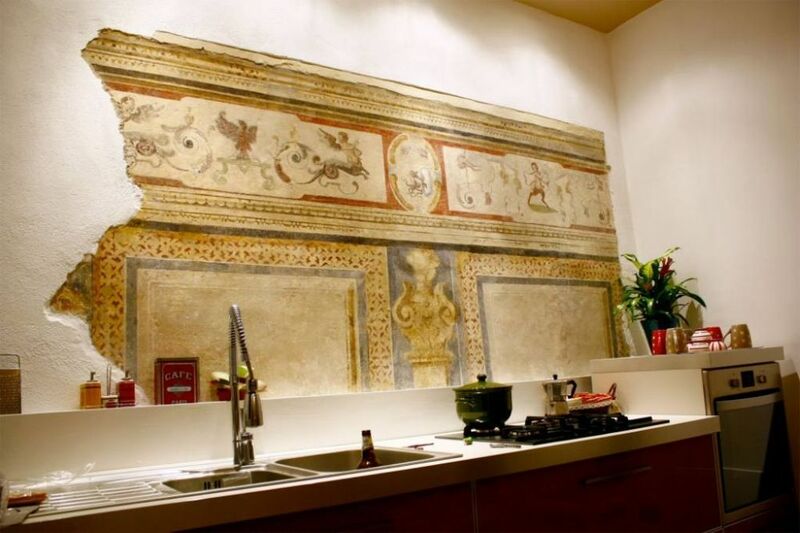 Holiday apartment "Cá del Borgo" is a cozy apartment for exclusive use, with frescoes and period fireplace, located in the heart of one of the main historic towns of Bergamo, a few steps from the Cittá Alta and the most important museums of the city. The apartment can accomodate up to 4 people, It consists of large livingroom room with confortable sofa bed, fully equipped kitchen, master bedroom with walk-in closet, large bathroom with cromo therapy. We absolutely loved our stay in Bergamo made all the more amazing through the help and kindness of Eliana. She could not do enough for us, and the local tips on where to eat and drink in the old town were brilliant..... suggest you visit both the trattoria and wine bar as you are in for a real treat! Thank you Eliana, we hope to be back to Bergamo again and would not hesitate to stay at your apartment. Lovely, clean space, with attention to detail in fantastic location. The apartment is spotless, roomy - perfect for couple. Kitchen has everything you need. All the cooking and breakfast basics are provided...so no need to shop for tea or coffee on first day. Location is fantastic, between the old citta alta and modern town. All the rooms are facing a little cobble street so car sounds can be a bit loader on cobble stones. (The windows are double glazed). It's very comfortable, very well prepared accommodation. It is obvious there is a lot of love and care here. Very frequent bus service nearby (100 metres) that zips you around towns (upper and lower). Get a multi-day ticket. No car needed unless you are travelling outside of town. Great local bars in tiny plaza nearby (50 metres) for coffee, drinks, snack. Eliana was so helpful, met us and showed us to the Apartment. Having stayed in numerous holiday apartments over the last 26+ years I would rate the owner in the top 3 for her attention to detail and total desire to make your stay memorable for all the right reasons. Met us at the appointed time and location with a smile and genuine desire to assist. Showed us around the apartment which was as per the pictures. She provided breakfast for the duration of our stay. Eliana spent time with us outlining what was in the immediate area by way of cafes, bars and restaurants. She even organized parking (paid) for us. Rang us later to see if she could assist us and to ensure we were settled in comfortably. The area the apartment is in is very safe and we had no issue going out after 9pm for meals. Eliana suggested that we might enjoy a visit to the old Bergamo township. This visit was the highlight of our stay. The old township is a very comfortable an picturesque walk of some 20 minutes. Really is a beautiful place with the streets lined with medieval buildings. You could and should spend half a day wandering around the street of the old town. Within five minutes walk from the apartment there are half a dozen cafes,bars and restaurants and a small store where the lovely lady sells all the basic necessities. It would be a mistake not to take the chance of staying in this apartment. Beautifully renovated and very comfortable. Very good location close to the Citta Alta. The owner could not have been more helpful or attentive. My wife and I stayed here for the last two nights of our Italy honeymoon. Eliana is a fantastic host and took great care of us. She met us outside the apartment, took us up to it and gave us a great detailed walk through. The apartment is nicely redone and comfy and is in an amazing old building situated in an old part of Bergamo. The location itself is fantastic for walking to the upper Bergamo section on the hill. Great food nearby. We really loved our stay here and highly recommend for a stay in Bergamo. We would love to make it back there. Thanks Eliana!! Tariffe scontate in relazione alla durata, Tariffe in funzione del numero di persone, Proprietario non presente in loco Si chiede alla gentile clientela di aver cura della casa e di spegnere sempre il riscaldamento prima di andare via. Grazie!! !